Mechanisms, Time, and Sound the Focus of Skinner Auction of Clocks, Watches & Scientific Instruments on April 12 | Skinner Inc.
Offering 70 lots of classics and curiosities related to mechanics and the history of watches acquired throughout Bernhard Stoeber’s long career perfecting the creation, service, and quality control surrounding watches and their technicians. Stoeber worked for notable firms such as NAWC (today the Movado Group), Omega, Tissot, and Rolex. 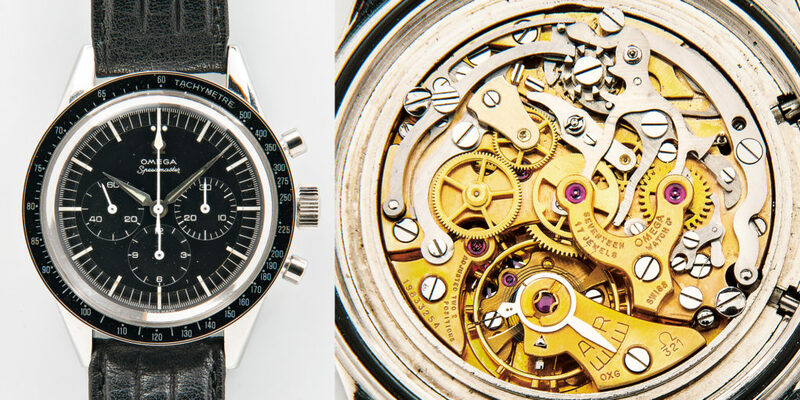 Examples include an Omega Speedmaster Reference 2998-3, c. 1962 (Lot 103, Estimate $8,000-12,000), and a Rare and Unusual Pocket Chronograph (Lot 104, Estimate $2,000-2,500). Also on offer is the remaining portion of the John F. Gelson Hamilton Watch Co. collection, which includes some tooling and miscellany from the Hamilton factory, as well as additional model and sample movements. Timepieces on offer also include a Gawen Brown Mahogany Tall Clock, Boston, c. 1760 (Lot 185, Estimate: $3,000-5,000) and a small collection of mantel and wall clocks and regulators. Skinner is proud to be presenting two significant collections of early surveying instruments: The Collection of the Late William H. Skerritt, Part I, focusing on his historical collection of Troy’s instrument makers’ work, as well as documents and archive material relating to instruments made in Troy, New York, and the surrounding area by Hanks, Meneely, and Gurley Precision Instrument Company, and rare surveying instruments and early manuals and catalogs including William Gurley’s 1873 personal copy of American Engineers and Surveyors Instruments. On offer is a “Burt’s Solar” Compass Prototype by William J. 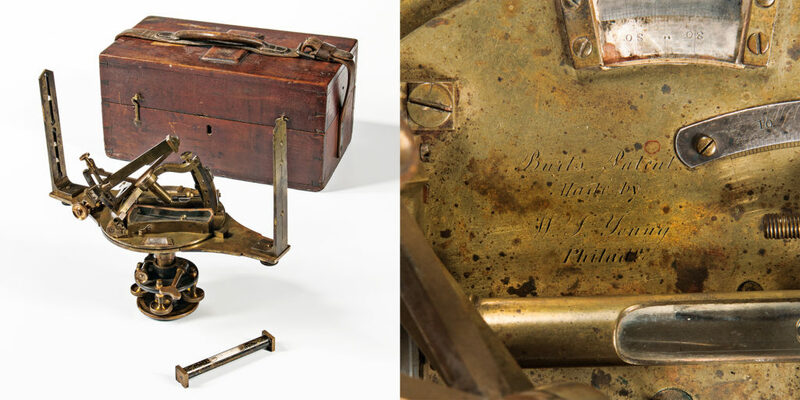 Young, c. 1840 (Lot 390, Estimate: $4,000-6,000) and a Julius Hanks Bow Compass, Troy, New York, c. 1834-45 (Lot 324, Estimate: $2,000-4,000). Part II of the Robert Miller Collection of Pennsylvania Surveying Instruments includes a Benjamin Rittenhouse Surveyor’s Compass, c. 1786 (Lot 370, Estimate: $2,500-3,000). 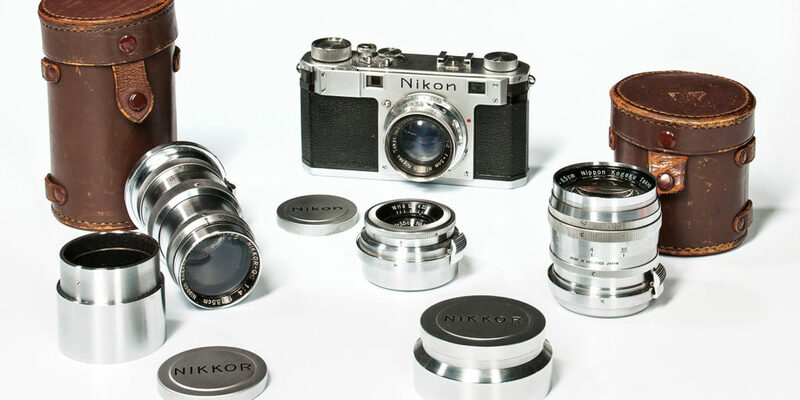 Other auction highlights include a small group of rare and early examples of European and Asian photographic instruments collected over the last 40 years for their mechanical rarity such as an H.J. Redding & Gyles “Luzo” Box Camera, c. 1899 (Lot 303, Estimate: $5,000-6,000), and an Early Nikon M Rangefinder Camera and Lenses (Lot 311, Estimate: $25,000-30,000). The sale also includes an array of cylinder and disc musical boxes, a small collection of 19th century European steam engines, medical apparatus, microscopes, and fountain pens. Skinner attracts top consignments and commands record-breaking prices in the international auction marketplace. With renowned expertise and extraordinary service, Skinner is the place for buyers, sellers and the passionately curious. Skinner appraisers are familiar faces on PBS’s 16-time Emmy Award-nominated ANTIQUES ROADSHOW. Visit us in Boston, Marlborough, New York or Florida, or online at https://www.skinnerinc.com. This entry was posted in News and tagged antique cameras, antique clocks, antique watches, Boston clocks, chronograph, clocks auction, compass, dive watch, fine watch, mahogany clocks, pocket watches, rare clocks, tall clocks, vintage chronograph, vintage watch, wristwatch by Kerry Shrives. Bookmark the permalink.